Kids, that's the way it really works. There aren't enough rich people to fund all the government programs, so really anything you get comes from somebody else working hard. 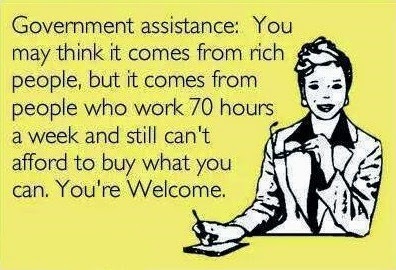 If you're on government assistance and aren't desperately looking for work to support yourself, you're stealing from a hard-working family that will have to make do with less because of you. For my many, many fans who have noticed I'm not posting as much, that's true. I have less urge to share my thoughts and more urge to intake information. There are people doing this stuff better than I do anyway. Want a new one to read? Try Captain Capitalism. He's a fantastic and frustrated very intelligent fellow with a lot of brilliance to share. Here's an example to get you reading: There's No Such Thing as Greed, Only Theft Hat tip to Mark who reads Cappers regularly. It even goes nicely with the above pictext.